Micro needling’s a beauty treatment that I never thought I’d let into my bathroom, only because it sounds a bit b­onkers. Most beauty scavengers insist on having this treatment done at an MD’s office, and I completely empathize. On the flip side, I also understand why people have decided to bring it into their homes. We’re talking about a treatment that is generally quite expensive when done at an MD’s office; it can range anywhere from $250 for one treatment to upwards of $1500 combined with more specialized treatments. The difficulty with these treatments is you don’t just get it done once and BAM perfect glowing skin for the rest of your life – additional maintenance sessions are required. Micro-needling also referred to, as derma rolling or just simply rolling is a treatment where a small roller covered in microscopic “microneedles” is run over the skin. These tiny needles create micro wounds; this sends a signal to our brain that our epidermis is under attack. When we cut, scrape or even intentionally puncture our skin in the name of beauty, our skins natural reaction is to repair itself. Our skin does this is in a few steps, but for our learning purposes, we will just cover the following 3: granulation, revascularization, and remodeling. Revascularization: A new network of blood vessels are born, this helps deliver nutrients and oxygen, which aids the reconstruction of the wound. Remodeling [personally I find this wild! ]: So now there’s collagen at the wound site, and this collagen eventually converts itself from type 3 to type 1. Type 1 collagen is strong, and in adding strength to the skin IT CONTRACTS by 40-80%. Opposing sides of the wound are pulled together, thus causing that original site to SHRINK…. To SHRINK. This is the easiest way I can explain the science without simply saying “just trust me”. I know the idea of derma rolling can be daunting but once you get past what the name and appearance of the tool, it becomes worthwhile. There are a few things to consider with rolling, depending on the length of the needle. Face will feel tighter and drier. If you neglect to disinfect your roller or roll into active acne or pustules the needles could spread bacteria, causing an infection or a reaction. With deeper rolling on darker skin, it’s possible to have Post-Inflammatory Hyperpigmentation. Essentially when the skin goes to repair itself it produces too much melanin, which creates a discoloration. My skin and your skin are different, and it’s important to remember to tailor your rolling to suit YOUR skin. From serums, needle depth and the number of rolls, make sure you do the appropriate research to have the most rewarding sessions. 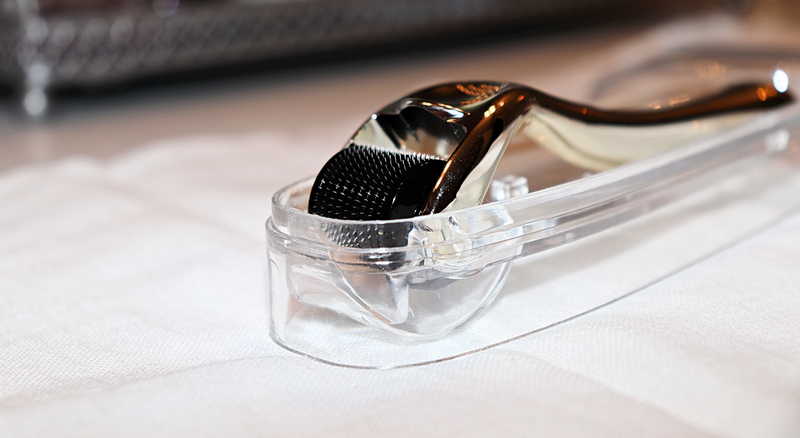 Our follow up article “HOW TO: Micro Needling” will be available in due time! Now that you know more do you think you’d ever consider trying this? Next Post Bronzed No-Makeup Look!